Lattice screens–or “hideaway” screens–are structures built to conceal the more unsightly elements found around a house. 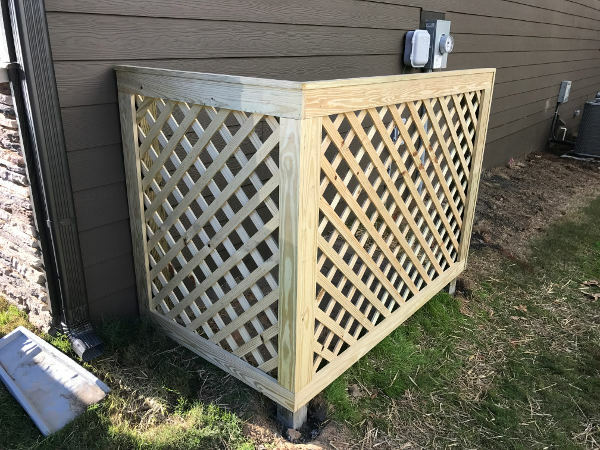 Whether you want to hide a cluster of trash cans, a propane tank, or an AC unit, the lattice screen build described in this article will give you all the details you need to tackle the job from start to finish. Painted and fully finished lattice screen. Building a stand-alone lattice screen is really no different than building a small fence. Posts are seated in the ground with concrete, and lattice (rather than pickets) is mounted to these posts. That said, getting post heights set correctly is very important to the outcome of this project. I always use a variety of levels to get these elements right. I’ll show each of them below, and demonstrate their uses. Most lattice screens are laid out in an L-shape in order to conceal their contents from two vantage points. This also helps structurally, because L-shapes (with one post acting as a corner) are naturally stronger than straight runs. 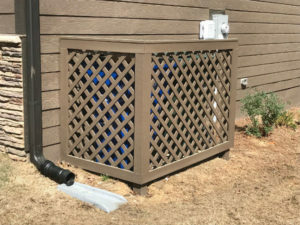 The lattice screen in this project was intended to hide two wheeled trash cans. 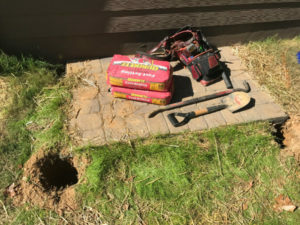 My clients had already had a flagstone pad installed to accommodate the bins, so the corners of this pad provided me with very accurate locations for my post holes. You could lay out yours as needed to account for the size of whatever your trying to conceal. 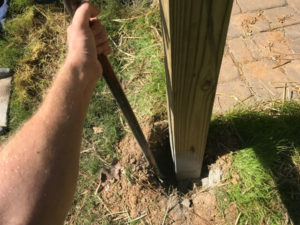 Post holes only need to be about twice the diameter of posts, roughly 8″-9″. Their depths depend more on the intended height of your structure. 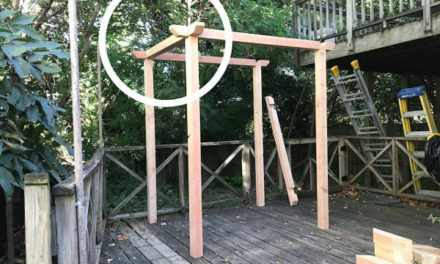 For a 4′-tall screen (which works well with typical lumber measurements), 16″ should be a good depth for post holes. When digging near your house, always be on the lookout for underground utilities. Cable lines, water lines, and even electrical lines may be resting just below ground surface. For this reason, I like to take a very controlled approach to digging post holes. I use a pry bar for gouging up hard ground, and a small spade shovel for lifting out dirt. Set loose dirt in a bucket or wheel barrow as you bring it up. This way, it can be easily transported to another area of the yard for spreading. 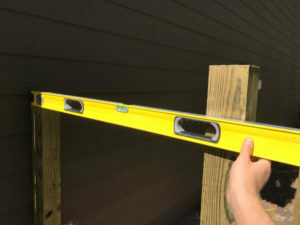 This step can be a little difficult, because you want post heights to all stand at the same level, but post hole depths will vary. 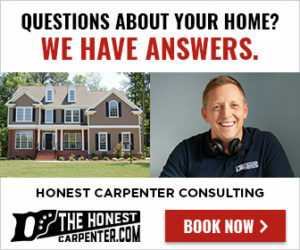 I’ll explain a couple tricks I use to work this problem out. Start with the post hole located at the highest ground level (probably the one closest to the house if you’re doing a screen like this one). 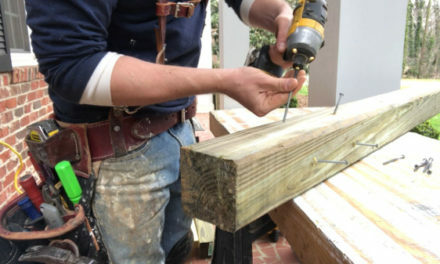 Set an uncut 4×4 post into the hole and have someone hold it upright. 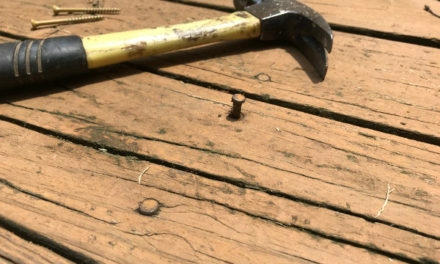 Drive a screw straight into this mark, and tie a piece of string to it. 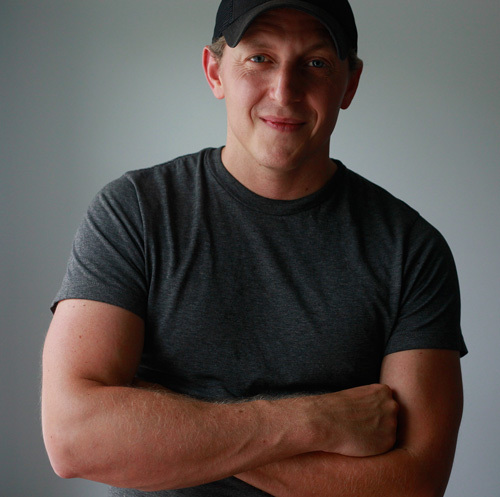 I used my chalk box line because I carry it in my tool belt, and it helped for making my next mark. Now, set another 4×4 post into the hole at the far corner and hold it upright. Pull the string connected to the first post tight, and wrap it around the second post. At this point, I use a “line level” to find an equal elevation across the posts. Line levels are just short, cylindrical spirit levels that are light enough to hang on a taut string without deflecting it (pictured below). 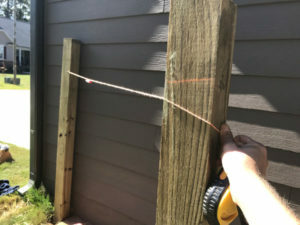 I hook the line level onto the string, then move the string up or down the second post until the bubble rests in the center of the gauge lines. When the string is reading level, I mark the string location on the second post. 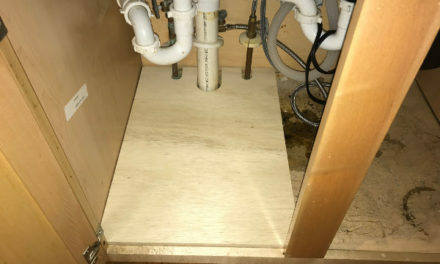 Being careful not to confuse these two posts, cut them to length on the miter saw, then put them back into their post holes. Put the third post in its hole and hold it upright. 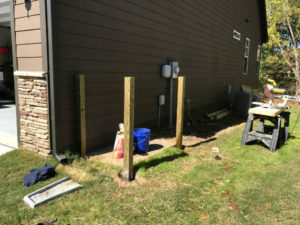 Set a 48″ level on top of the newly cut post near the house, and rotate the free end upwards until the tool is reading level. Now, use your pencil to mark a line along the underside of the tool on the face of the uncut post. Take the third post to your miter saw or circular saw setup, and cut at the marked line. 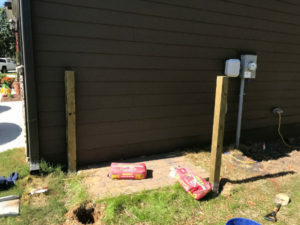 At this point I use a level to get my posts standing plumb, and then trap them in place by dumping pre-mixed concrete and just a little water into the hole. There’s not much of an art to mixing concrete like this. Just don’t overwater it. Start by pouring just an inch or two of water down into the hole, then adding about half the bag. You can mix the compound in the hole with the long end of pry bar, or a skinny piece of lumber. Add just a little more water, and then the rest of the concrete. Just keep checking your posts with a level to be sure that they’re plumb. You can crank them into place with a little force, then tamp the concrete down to trap them. Also, take a step back periodically to look at your post arrangement from a distance. Make sure the posts line up well visually. And, don’t lift your posts! It could be very difficult to get back down to their appropriate heights. Being careful not to jostle your posts, pull measurements from the first post to the second post, and the second post to the third. These will be the lengths of your lattice pieces. 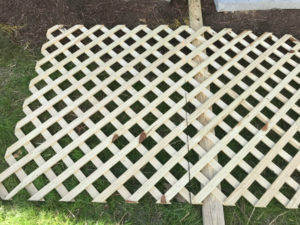 Lay your lattice it on the ground with a length of 2×4 beneath it. Hook your tape onto the end of the lattice at the longest point, and pull across the face of lumber. Put one measured mark near the top edge of the piece, and one near the bottom edge. Then, use a long straight-edge to connect these marks with a pencil line. Move the 2×4 prop block to just a few inches away from this line for support. Make sure your blade is only set to about 1-1/4″ cut depth, and carefully cut at the line with a circular saw. Keep your feet, hands and clothes out of the way as you work the blade across the surface of the lumber. The saw will want to fall into the various gaps, and the sole plate will get hung up on ledges. You’ll have to rotate the saw up and down slightly when this happens to clear the obstructions. Just go slow, and try not to twist the blade in the cut. If you’re patient, you can get a pretty straight without tearing up the individual lattice pieces. 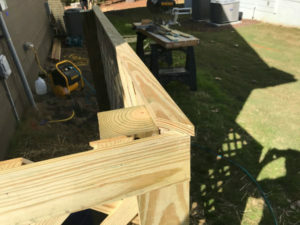 Use a brad nailer to attach the lattice to the 4×4 post. Shoot through the doubled-up, overlapped sections of lattice. These thicker areas will provide more fastening power. Brad nails are really just temporary fasteners in this situation. When the adhesive dries, it will create an extremely strong, long-lasting bond on its own. 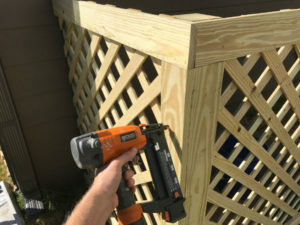 At this point, you can attach pieces of 1″x6″ treated trim to the posts over the lattice using a very similar method. Now run horizontal trim pieces on the shorter side of the unit, but make them long enough to overlap and conceal the exposed ends of the trim pieces you just put on (as shown in the picture above). 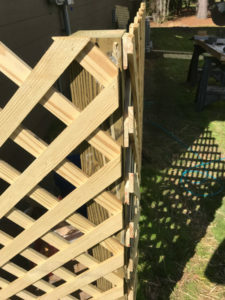 When the horizontal pieces are done, cut and install vertical pieces in a similar fashion, using the pieces on the short side to overlap and hide the edges of pieces on the long side. To finish off the trim, I like to rip a 1″x6″ into 1-3/4″ widths on the table saw, and use it as a concealment strip along the top and rear edges of the unit. These pieces hide the ugly lattice edges otherwise left exposed. 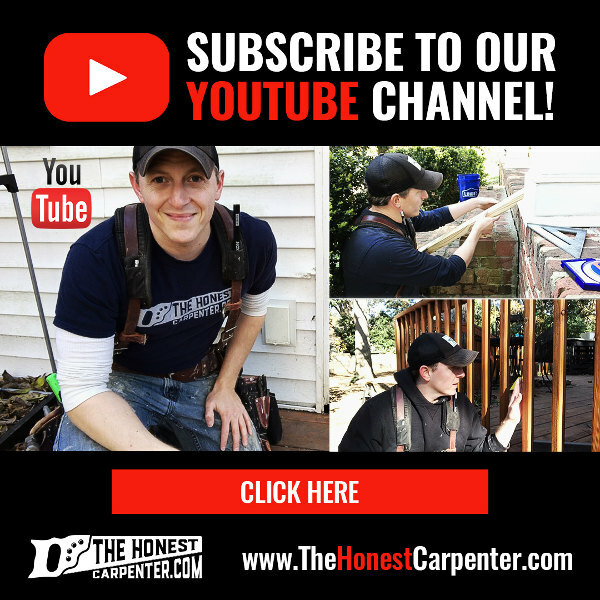 You can create just a little overhang–or “reveal”–by pulling the pieces forward, so that they jut out just past the horizontal trim boards beneath them. Cut 45 degree miters on any end that turns a corner, and glue and shoot these pieces into the place. Just let your concrete set up overnight, and you’ll have a strong, stable lattice screen. You can also feel free to paint or stain the unit whatever color you like–but be sure to wait a week or two before doing so! Treated wood needs time to dry out before it will accept any finish.